Synchronized cardioversion distributes a low energy shock in order to treat specific types of cardiac arrhythmias. A regular cardiac cycle has a refractory period and a vulnerable period. The vulnerable period happens during the half-way point or towards the second portion of the T-wave while the refractory time frame is during the QRS complex. The shock is administered during the QRS period because if it were delivered during the vulnerable period, it could create ventricular fibrillation. 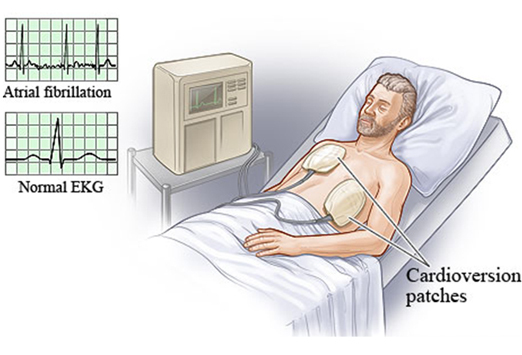 Synchronized cardioversion is a kind of low energy shock, using a sensor to deliver electricity which is synchronized with the highest point of the R-wave or the peak of the QRS complex. When the actual button is pushed to deliver the shock, there is a slight delay so that the machine can read and synchronize with the ECG rhythm of the patient. This treatment is used when other types of treatments, such as medications, have failed to work. It is used to successfully treat atrial flutter, supraventricular tachycardia, atrial fibrillation and atrial tachycardia. Unsynchronized cardioversion (defibrillation) delivers high energy shock right after the shock button was pushed on the defibrillator, which means the shock can fall anywhere in the cardiac cycle. This is used when coordinated intrinsic electrical heart activity (pulseless VT/VF) no longer exists or when the defibrillator can't synchronize in unstable patients. Refrain from eating or drinking anything for 6 to 8 hours before the procedure. Do not drink caffeine 24 hours before this procedure. Avoid caffeine products, including regular coffee, decaf coffee, regular and decaf tea, soda, herbal tea and chocolate. Get there 30 minutes before your appointment. If you are a diabetic, have your monitor for your blood glucose levels with you, along with your medication and test strips. You should wear clothe that you can remove from the waist up, like a shirt; Besides, you will be provided with a gown. You will be injected with certain medication that will make you drowsy, so make sure you have someone who can drive you home after the procedure. How Is Synchronized Cardioversion Done? A nurse or health care professional will transport you to the place where the procedure will occur on a hospital bed or cart. The team working on you will include your doctor, a nurse, a technician and maybe even an anesthesiologist. Your vitals will be monitored, so you will be supplied with a blood pressure cuff and a clip on your finger to keep track of your oxygen level. Besides, EKG (Electrocardiogram) patches will be used to keep track of your heart rate. An IV of fluids will be set up and you will receive oxygen via a tube in your nose or an oxygen mask. Large adhesive defibrillator pads will be placed on your front area and back. They will be used to administer the electrical impulses to your heart to bring it back into rhythm. For that reason, you may have to have more than one impulse administered. Once the procedure has been completed, you will be brought back to your room. It will take a couple of hours for the anesthesia to wear off. A nurse will continue to monitor your vitals including your blood pressure, heart rate and rhythm. Once you are completely awake, you will be able to drink and eat again. You doctor may prescribe you some medications to take at home. Some patients might have a little tenderness or redness where the patches were placed. If you are experiencing any discomfort you can ask the nurse for some topical treatments. Do not drink alcohol for at least 24 hours. Do not drive a vehicle or operate any heavy machinery for 24 hours. Do not make any decisions that will be legally binding for 24 hours. Set up your follow-up visit with your doctor and make sure to ask the nurse or doctor any questions you may have. There is always a chance that something may go wrong during any procedure. If the machine can't sense properly, a few adjustments will be made. It may indicate that the amplitude, or gain, may need to be adjusted. A complication from a synchronized cardioversion is hypoxia. This is when a patient may have trouble breathing by themselves because of the anesthesia administered. In this case, they might have to be ventilated manually. Additional complications could include dysrhythmia which includes ventricular fibrillation or hypertension. Don't be alarmed if the procedure isn't a complete success. For some people, it is hard to get the heart rhythm corrected properly. As long as the heart is not beating too fast, many people learn to live with an irregular rhythm. If it needs further adjustments, your doctor will speak to you about other possible forms of treatment.